We are a UK southern counties-based Chinese therapeutic arts teaching and service-providing organisation. 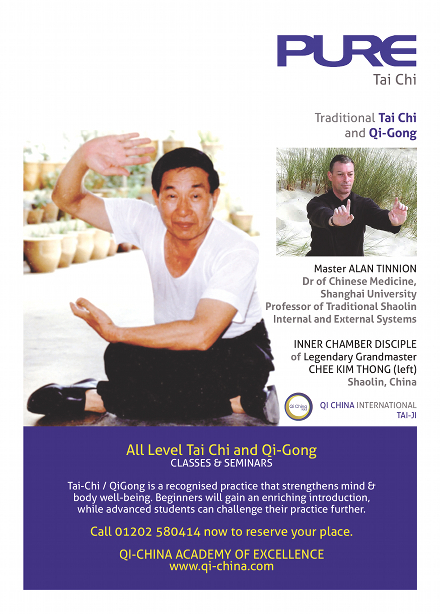 Qi China is at the forefront, in the UK, of promoting greater knowledge and awareness of the medical value and effectiveness of TCM and accurately taught medical qi-gong, medical Tai Chi, and Qi Healing. We provide walk-in classes, mixed gender or female only, in Bournemouth, Poole and neighbouring areas of Dorset and Hampshire to suit beginner, intermediate, and advanced level students. We also offer courses, seminars and workshops and our website includes a videos facility providing educational material. Click here to see a brief video clip exerpt from a class that was shown on a Far Eastern (Taiwanese) TV news report about the promotion of Chinese culture in the West. Qi China International also provides medical condition specific classes. Our therapeutic healthcare exercise sessions provide for sufferers from such conditions as stress, arthritis, cardiovascular, and respiratory / pulmonary conditions, relief and wellbeing. For information about class locations, times and enrolment, please telephone: 01202 580 414. 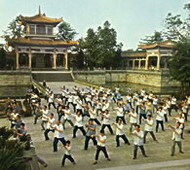 More information about our classes and services is available at www.tai-chi-bournemouth-and-poole.co.uk. Note: We can provide short pilot courses that offer free membership and tuition / no-class fees, that may be available in your area. To register your interest and learn more please call the number above.